Huge Funky NOAH's ARK BUTTON EARRINGS - Dimensional Front, Flat Back Hand Painted RESIN Charm. 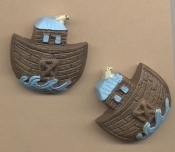 Bible Story Boat - Religious Holiday Spiritual Symbol Stud Post Novelty Costume Jewelry, approx. 1.25-inch (3.13cm) Diameter.